The hotel has 18 double rooms; most of them twin bedded and some adjoining rooms, 6 single rooms and one family room with a balcony. The rooms are bright, comfortable and cosy and most of them have balconies. They are all equipped with the usual amenities, and all have either a separate bathroom or shower room with toilet, hairdryer, radio, direct line telephone, cable television, minibar and safe. The south facing rooms overlook the Combins mountain range while the north facing rooms are perfectly positioned for watching the bustling life of Verbier. 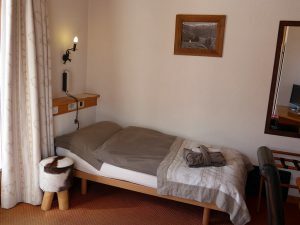 Double roomsmsouth facing, twin or double bed, mountain view with shower or bath. Double rooms north facing, twin beds, street view with shower. Double rooms north facing, Small double room, street view with small shower. 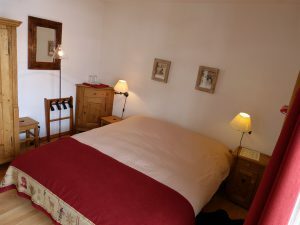 Double rooms north / south west facing, 2 adjoining rooms and one single room (ideal for 5 people) with shower. Single rooms north facing, single bed, street view, shower. Family room north facing, 1 large double bed, north facing with balcony and shower and 1 twin bedded room with shower. (One entrance to the two rooms). 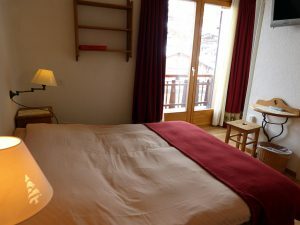 Our hotel is next to the tourist office, right in the heart of Verbier, sur-rounded by shops, restaurants, bars and nightclubs.